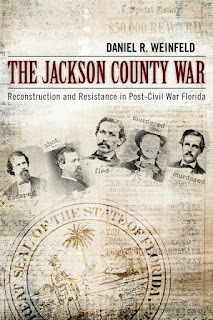 From 1869-1871, a nondescript county in the Florida panhandle became a battleground. Its citizens terrorized each other with outbursts of brutal violence followed by anxious periods of eerie quiet. The period became known throughout the nation as the Jackson County War because the number of murders that occurred there far outnumbered those in the rest of the state combined. Daniel Weinfeld has examined the causes and effects of these depredations, sometimes in almost mind-numbing detail (witness the 11-page biographical index of major figures chronicled in the book). One can hardly blame Weinfeld, however, for his enthusiasm. He makes excellent use of rich storehouses of primary sources including dozens of newspapers, Freedman's Bureau records, state documents, court transcripts, Congressional hearings, and collections of personal memoirs and letters. What emerges is a saga of social upheaval, economic devastation, political chicanery, and personal animus; a toxic scenario that was repeated time and again throughout the South after the Civil War. Just how many people were murdered during the Jackson County War has never been definitively established. Weinfeld correctly maintains, however, the exact number is far less important than the issues that precipitated them. The author analyzes each in their turn. While the county's black politicians tended to be conservative, Weinfeld maintains that the most serious problems arose from “the impression among whites that the [black] community was organized, disciplined, and heavily armed.” Also, a new generation of white leaders tended to come from the county's newly enriched merchants and lawyers, not the old patrician plantation elite which experienced a loss of power and prestige. The newly empowered class “were strongly associated after the war with the Regulators” and the Ku Klux Klan. Finally, a small but savage 1864 skirmish fought in Marianna, the county seat, continued to have repercussions between the races long after the war ended. No other Florida county suffered so many civilian casualties or so much property damage. Today, there is nothing in Jackson County to memorialize the events that happened there. Weinfeld maintains this “shames our forgetfulness.” But as long as there are intrepid investigators like Daniel Weinfeld, the truth will out and it will set us free.